Yet we often find it difficult to follow that command. Relationships and responsibilities vie for our attention, and prayer often gets placed on the back-burner. But it’s possible to make 2019 your year of focused and increased prayer! 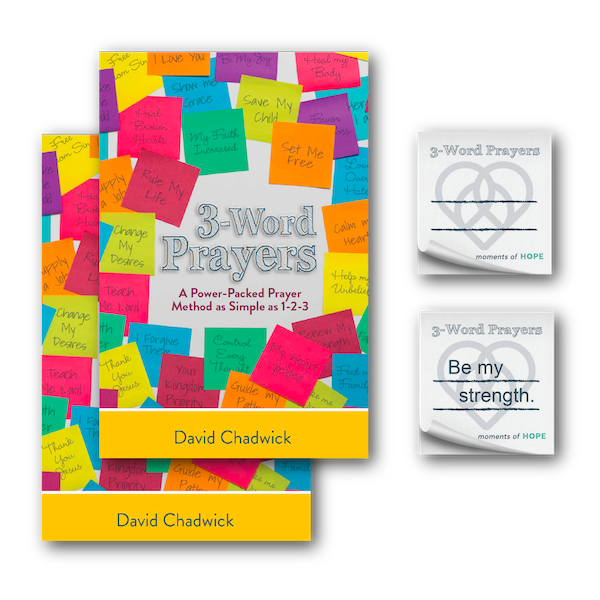 David Chadwick’s latest booklet, 3-Word Prayers, can help you do just that. It suggests a power-packed approach to prayer that cuts through life’s busyness. And, it’s as simple as 1-2-3—just trim your prayers to three words. Help you shape more strategic prayers. Sharpen your engagement with Scripture. Encourage you to meditate on God’s presence. The 3-Word Prayers booklet comes with corresponding sticky notes for recording and posting simple, 3-word prayers. You can stick a “Soothe her soul” note to a crying child’s crib or a “Give me strength” post to your desk at work. We want to send you TWO copies of 3-Word Prayers and TWO packs of sticky notes as thanks for your gift today to give others a life-giving reason for hope in 2019. Keep one booklet and set of notes for yourself and “pray it forward” by giving the other booklet and notes to a friend. Also, if you give more than $50 we’ll send you a copy of my 3-Word Prayers CD series to say thanks. We hope you’ll share your own three-word prayers on the Moments of Hope Facebook page and on Twitter and Instagram using #3wordprayers. Thank you for your support today to give more people a reason for hope in Jesus.